Last summer I was struck by a severe case of wanderlust. I wanted urgently to be on my own in the woods, away from the radiating concrete and steel of New York in July. So I packed my bags and set out to the coast of Maine. On the way, I stopped to see a friend, and when he heard the purpose of my trip — to step outside the daily round of distraction and obligation — he pulled a book off his shelf and suggested I might want to take it along for the journey. 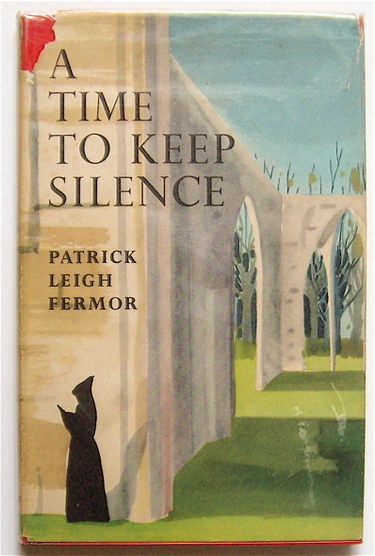 It was called A Time to Keep Silence by Patrick Leigh Fermor, and I quickly fell under its spell. At a mere 95 pages, it is a short read, yet nothing about it makes you want to rush. In the mid-1950s, Fermor, an English travel writer who as a young man once walked from Holland to Turkey, became interested in the life of monks. He decided to visit several Benedictine and Cistercian monasteries in France. A Time to Keep Silence is the record of those visits and it accomplishes something that few books do: It replicates in style and rhythm the very experience that it seeks to describe. The writing is spare, exactingly precise, and then occasionally quite beautiful, just as the life of the monks we hear about are pared down, highly concentrated, and every now and then sublime. In short, it’s a book about the contemplative life that delivers the reader into a contemplation of his or her own. When he first arrives at the Abbey of St. Wandrille de Fontanelle, Fermor is shown to his visitor’s cell. He writes, “a mood of depression and of unspeakable loneliness suddenly felled me like a hammer-stroke.” He is used to the world of entertainment and distraction, as most of us are, but all that has now ceased and there is nowhere for his nervous energy to go. To read that beautiful, restful sentence is to experience a small piece of the restfulness Fermor himself found. When we say that a book transports us, this is what we mean. The music of the words themselves sing us into a different world. I had my own time to keep silence in the woods in Maine last summer. I was lucky enough to have Fermor’s book along with me. We can’t all be monks, and most of us wouldn’t want to be, but the genius of excellent writing is that we can know something of what that other life is. You can also listen to Adam reading the above here. This entry was posted in A Time to Keep Silence and tagged A Time to Keep Silence, Patrick Leigh Fermor on July 10, 2011 by proverbs6to10.